Mexico’s central bank kept its key interest rate unchanged, saying that a half point increase in borrowing costs in June is helping to curb inflation risks, Bloomberg News reported. Banco de Mexico led by Governor Agustin Carstens held its overnight rate at 4.25 percent Thursday Aug. 11, a move predicted by all but one of 28 economists surveyed by Bloomberg. One analyst had forecast a 50 basis-point increase. Thursday’s decision follows the rate hike on June 30 that came amid market turmoil over the U.K.’s vote to leave the European Union. 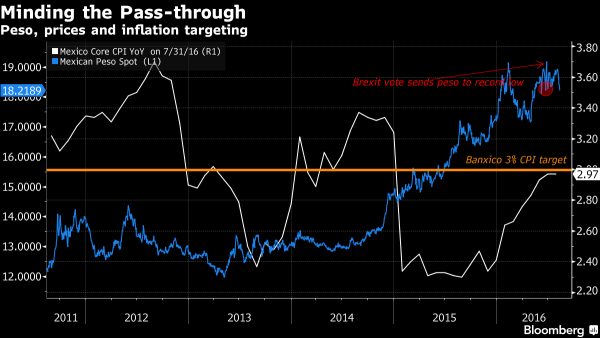 Since then, Mexico’s currency has recovered from its plunge to record lows triggered by the Brexit vote, while consumer price increases have remained below the central bank’s 3 percent target for the past 15 months. Mexico took bold steps to prevent the peso’s weakness from quickening inflation, including surprising markets with a half-point rate hike in February at an unscheduled meeting. Now Banxico says that inflation risks are neutral, while the economic growth outlook has deteriorated.